A headline grabbing-study published in Science last year that warned about the effects of plastic microbeads on larval fish is on the verge of being retracted. In a case involving missing data, shoddy research methods, and outright fabrication, it’s one of the most egregious examples of scientific fraud we’ve seen in quite some time, and a case in which there’s plenty of blame to go around. After a nine month investigation, an expert group at Sweden’s Central Ethical Review Board (CEPN) has concluded that Uppsala University researchers Oona Lönnstedt and Peter Eklöv committed scientific fraud while conducting an investigation into the effects of microplastic particles on larval damselfish. And it’s not just one or two things that the researchers did wrong—CEPN presented an entire laundry list of deficiencies, including a failure to submit the required documentation to Science, missing data, flawed research methods, questionable timelines, the absence of animal research ethics approval, and a slew of other problems. In fact, the deficiencies are so great, the CEPN team suspects the research wasn’t even performed as stated, and that the scientists fabricated much of the evidence. In its report, CEPN admonished Science for its negligence in the matter, writing: “[It] is remarkable that the article, given these deficiencies, was accepted by the journal Science.” The ethics board is now requesting that Science retract the paper, which the journal published in June 2016. Science is now reportedly preparing a retraction statement in light of CEPN’s findings. 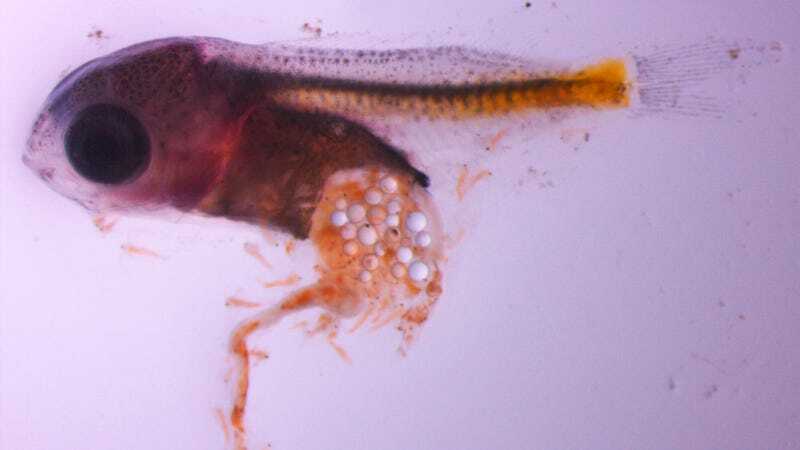 In the 2016 study, Lönnstedt and Eklöv demonstrated that fish exposed to high concentrations of microplastic particles (tiny beads of polystyrene) exhibit altered behaviors and stunted growth, making them more susceptible to predators. Disturbingly, the damselfish larvae—who were exposed to the plastic in aquariums—appeared to develop a preference for the plastic beads over natural food sources, marking the first time scientists had ever seen such behavior. The study highlighted a major new environmental concern associated with microbeads, which measure 5-10 micrometers across and can’t be filtered out by water treatment systems. These tiny bits of plastic are commonly found in cosmetic products like lipstick, mascara, facial cleansers, toothpaste, and similar products, and many jurisdictions have either banned or are considering bans on them. Allegations of impropriety first emerged ten months ago by scientists who blew the whistle on the paper, prompting Uppsala University to conduct a preliminary investigation of scientific dishonesty in August 2016. Remarkably, the university did not find any evidence of dishonesty or fraud. But in September, Bertil Borg of Stockholm University was assigned to lead the CEPN investigation, and his team reached a very different conclusion. In the Science paper, Lönnstedt and Eklöv claimed that an animal ethics committee had given its approval for the experiments. CEPN says this is simply not true, and that approval had been given for fish species other than those used in the experiments. On its own, that’s pretty bad, but that’s just the tip of the iceberg. More seriously, there’s a startling absence of data to back up the researchers’ claims. The reason, say Lönnstedt and Eklöv, is that a laptop containing the data had been stolen. They also claim that some data stored on the university’s databank was salvaged. The researchers say this original data can be found in the supplementary materials section of the paper which, very strangely, was not provided by the Uppsala researchers—either to Science or the CEPN group. CEPN also suspects that Oona Lönnstedt was not present at the Ar Research Station on Gotland, an island in the Baltic Sea where the experiments were purportedly carried out, to the extent claimed. The ethics board asked to see documentation of the work performed by Lönnstedt at the station, but it has not been provided. CEPN questions whether the research continued throughout the period of time stated by the Uppsala researchers. And there’s more. The CEPN group challenged the methods and conclusions reached in the paper. Most seriously, the Uppsala researchers said they didn’t remove any of the detergents found on the microplastic particles, presenting a very serious contamination issue. It’s possible that the detergents, and not the plastic, caused the observed effects on the fish. Other experimental concerns included the reported size of the larvae, the sizes of the beakers used in the experiments, how often the water was exchanged, and the temperature of the water, among other factors. The ethics board claims that Lönnstedt and Eklöv have had multiple opportunities to explain themselves and their research, but they have yet to provide anything of a satisfactory nature. At the same time, the Uppsala researchers counter that Borg has ties to the scientists who originally criticized the paper, and that he’s biased. The ethics board says this sort of crossover is “unavoidable” in a narrow field of research, and that the association doesn’t disqualify Borg, or members of the investigatory board. It’s important to point out that it’s not just Science that dropped the ball on this one—the university deserved some blame as well. The fact that Uppsala’s preliminary investigation found nothing is quite astounding. Sadly, data fabrication does happen in science. Back in 2015, a grad student faked data in a gay marriage study, and in 2013, a researcher falsified blood samples in an HIV study. Also sadly, this episode of scientific dishonesty is distracting us from the larger issue, which is that microplastic beads are problematic, and likely causing stress to a host of aquatic animals. Hopefully the scientific community will move past this and establish some credible conclusions on this matter one way or another.